Whisk sauce ingredients together in a small bowl and sit to side. Slice linguica rounds down the middle using a fillet knife to make two equal rounds. Heat medium skillet over medium heat. Once heated cook linguica for 4-5 minutes, flip and cook an additional 4-5 minutes. While linguica is cooking rub portobellos with 2 tbsp olive oil until coated well. Dust both sides with garlic powder, fresh crack pepper and kosher salt. Sit to side until read to use. Remove from pan and keep warm. Add onion to center of skillet and poor 1 tsp of olive oil over onion, cooking for 2-3 minutes. Flip onion over drizzle with 1 tsp olive oil and cook an additional 3-4 minutes. Remove onion from pan and keep warm with linguica. Add portobellos to skillet and cook cap side down for 5 minutes, flip and cook and additional 4-6 minutes or until caps start to soften and flatten out. Once cooked remove from heat. While caps are cooking lightly toast your onion rolls for 2-3 minutes in oven, placed directly on rack (or in my case the pizza stone.) Remove rolls from oven and spread 2-3 tsp of sauce over each underside of roll. Lay linguica on bottom bun, then spread out 1/4 of the onion rings over linguica, then cover with 1 slice of provolone, place one of the portobello caps over the provolone, top with 1 slice of Swiss and top of roll. Repeat with the remaining sandwiches and serve warm with sweet potato fries. Enjoy! Slice linguica rounds down the middle using a fillet knife to make two equal rounds. Rub portobellos with 2 tbsp olive oil until coated well. Dust both sides with garlic powder, fresh crack pepper and kosher salt. Rub onion slices with 2 tsp of olive oil. Spread 2-3 tsp of sauce over each underside of roll. 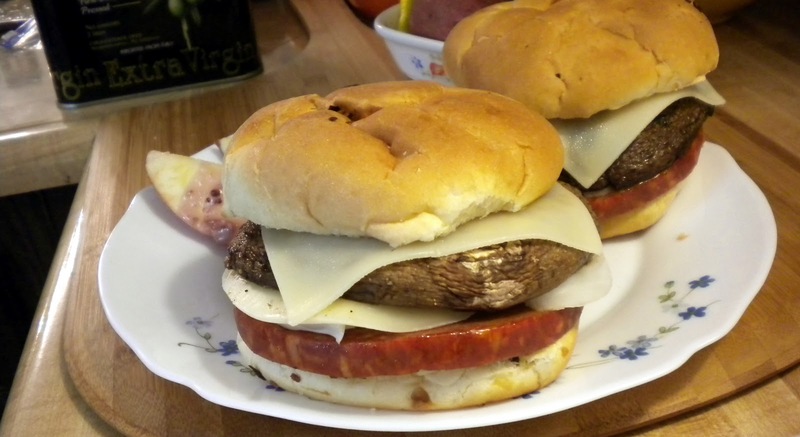 Lay linguica on bottom bun, then spread out 1/4 of the onion rings over linguica, then cover with 1 slice of provolone, place one of the portobello caps over the provolone, top with 1 slice of Swiss and top of roll. Repeat with the remaining sandwiches and serve warm with sweet potato fries. Enjoy!